Set your thermostat as low as is comfortable in the winter and as high as is comfortable in the summer. Bleed trapped air from hot-water radiators once or twice a season; if in doubt about how to perform this task, call a professional. During the heating season, keep the draperies and shades on your south-facing windows open during the day to allow the sunlight to enter your home and closed at night to reduce the chill you may feel from cold windows. During the cooling season, keep the window coverings closed during the day to prevent solar gain. Select energy-efficient products when you buy new heating and cooling equipment. Your contractor should be able to give you energy fact sheets for different types, models, and designs to help you compare energy usage. For furnaces, look for high Annual Fuel Utilization Efficiency (AFUE) ratings. The national minimum is 78% AFUE, but there are ENERGY STAR models on the market that exceed 90% AFUE. For air conditioners, look for a high Seasonal Energy Efficiency Ratio (SEER). The current minimum is 13 SEER for central air conditioners. ENERGY STAR models are 14 SEER or more. If you live in a climate where it cools off at night, turn off your cooling system and open your windows while sleeping. When you wake in the morning, shut the windows and blinds to capture the cool air. Install window coverings to prevent heat gain through your windows. Set your thermostat as high as comfortably possible in the summer. The smaller the difference between the indoor and outdoor temperatures, the lower your overall cooling bill will be. Keep your house warmer than normal when you are away, and lower the thermostat setting to 78°F (26°C) only when you are at home and need cooling. A programmable thermostat can make it easy to set back your temperature. Avoid setting your thermostat at a colder setting than normal when you turn on your air conditioner. It will not cool your home any faster and could result in excessive cooling and unnecessary expense. If you use air conditioning, a ceiling fan will allow you to raise the thermostat setting about 4°F with no reduction in comfort. Turn off ceiling fans when you leave the room. Remember that fans cool people, not rooms, by creating a wind chill effect. When you shower or take a bath, use the bathroom fan to remove the heat and humidity from your home. Your laundry room might also benefit from spot ventilation. Make sure bathroom and kitchen fans are vented to the outside (not just to the attic). 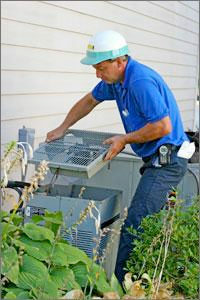 Schedule regular maintenance for your cooling equipment. Avoid placing lamps or TV sets near your room air-conditioning thermostat. The thermostat senses heat from these appliances, which can cause the air conditioner to run longer than necessary. Vacuum registers regularly to remove any dust buildup. Ensure that furniture and other objects are not blocking the airflow through your registers. Install efficient lighting that runs cooler. Only about 10% to 15% of the electricity that incandescent lights consume results in light; the rest is turned into heat. Take advantage of daylight instead of artificial lighting, but avoid direct sunlight. Wash only full loads of dishes and clothes. Consider air drying both dishes and clothing. Minimize activities that generate a lot of heat, such as running a computer, burning open flames, running a dishwasher, and using hot devices such as curling irons or hair dryers. Even stereos and televisions will add some heat to your home. Seal cracks and openings to prevent warm air from leaking into your home. Add caulk or weatherstripping to seal air leaks around leaky doors and windows. Water heating can account for 14% to 25% of the energy consumed in your home. Turn down the temperature of your water heater to the warm setting (120°F). You’ll not only save energy, you’ll avoid scalding your hands. Install tight-fitting, insulating drapes or shades on windows that feel drafty after weatherizing. When you are asleep or out of the house, turn your thermostat back 10° to 15° for eight hours and save around 10% a year on your heating and cooling bills. A programmable thermostat can make it easy to set back your temperature. Schedule service for your heating system. Find out what maintenance is required to keep your heating system operating efficiently. Furnaces: Replace your furnace filter once a month or as needed. Keep your fireplace damper closed unless a fire is burning. Keeping the damper open is like keeping a window wide open during the winter; it allows warm air to go right up the chimney. When you use the fireplace, reduce heat loss by opening dampers in the bottom of the firebox (if provided) or open the nearest window slightly — approximately 1 inch — and close doors leading into the room. Lower the thermostat setting to between 50° and 55°F. Use light-emitting diode — or “LED” — holiday light strings to reduce the cost of decorating your home for the winter holidays. Copyright © 2019 Flock's Heating & Air Conditioning, Inc. All Rights Reserved.